Cannot be Normal Summoned/Set. Must first be Special Summoned (from your hand) by banishing 2 Dinosaur-Type monsters from your Graveyard. Once per turn, during either player’s Main Phase: You can destroy 1 monster in your hand or field, and if you do, change all face-up monsters your opponent controls to face-down Defense Position. This card can attack all monsters your opponent controls, once each. At the start of the Damage Step, if this card attacks a Defense Position monster: You can inflict 1000 damage to your opponent, and if you do, send that Defense Position monster to the Graveyard. Ladies and Gentlemen, boys and girls, we begin our annual Top 10 countdown today, and I have to say, the final list is pretty solid. In the past few years, these top 10’s have produced some questionable selections, but my feeling is that 2017 produced 10 to 12 cards that overwhelmingly separated themselves from the pack, and that feeling was validated after the votes were cast. We start with Ultimate Conductor Tyranno. Only two cards on my list differed from the pojo list by more than 5 spots, and this was one of them. My ranking for him was #3 for two distinct reasons. First, as most of you readers know by now, my review always consists of a future potential rating. I feel it’s just as important to the well-rounded review of a card as its current status. And Ultimate Conductor Tyranno is truly unique among the other top 10 cards of 2017 in that there’s probably little chance it will ever get restricted or banned, and yet this monster is so incredibly good, that he will be an unquestioned staple in dino decks now and in the future. 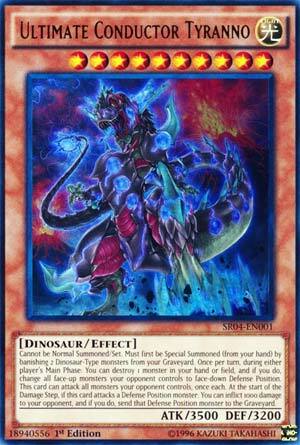 Secondly, while dino decks didn’t make quite the impact that SPYRAL, Zoo, and True King/Draco had on the TCG during the year, my impression has always been that the other archetypes had at least two truly broken cards to work with while Dinosaurs had a more rounded lineup and just Tyranno as its lone elite star. To me, tournament results shouldn’t be the biggest factor in determining greatness, because the best decks are the ones with the best 40 cards total. Tyranno is a lone ferocious beast. Top 10 CoTD for 2017 is here and lets get straight into it with our #10: Ultimate Conductor Tyranno. One of the new Dinosaur monsters that led to the True King Dino deck being so dominant, as well as lending support to an old archetype, UCT has so much going for it. Two Dino-Type monsters to banish isn’t tough at all to attain in a True King or a dedicated Dino deck. 3500ATK is huge for such an easily Special Summoned monster, and then there’s its effect. Book of Eclipse for your opponent for one monster in your hand. UCT can also be Red Dragon Archfiend and attack everything your opponent has and on top of that it can do 1000 damage when it sends a defense position monster to the grave instead of destroying it. Burn effect, Book of Eclipse effect, easy Special Summon ability with the ability to be Special Summoned by regular means, and high ATK, this card has too much going for it. 2017 is over and we now look at the Top 10 cards of 2017, the number 10 card was inside the Dinosmasher’s Fury Structure Deck and was the Boss Monster of the deck, Ultimate Conductor Tyranno. UCT is a Level 10 Light Dinosaur with 3500 ATK and 3200 DEF. Both ATK and DEF are very good, Level 10 has little advantages, Dinosaur type makes it searchable now while the Level lets you use Ultra Evolution Pill to summon him from the deck, and Light has some advantages. UCT cannot be Normal Summoned or Set and must first be Special Summoned by banishing 2 Dinosaurs from the GY. Very easy summoning conditions for this powerhouse, outstanding! Once per turn, during either Main Phase, you can destroy a monster in your hand or field to set all monsters your opponent controls. Links cannot be set, but everything else can, and you cannot make much use out of set monsters. This destruction effect also triggers effects of cards like the Baby Dinosaurs or True Kings. UCT can attack each monster your opponent controls once, so you should be able to clear their board with great ease since this guy has high ATK stats. Finally, when this card battles a defense position monster, you can send it to the GY immediately and deal 1000 damage. If you can get this off with like 3 monsters at least, this can do heavy burn, and there is no reason why you shouldn’t be using this effect attacking a monster in defense mode, because normal battles do no damage. This card would be a welcome Boss Monster for any deck, but Dinosaurs were the lucky ones to get this guy.